On screen, Robin Williams was a whirlwind of energy. Off screen, Williams channeled that energy into charitable work. The late actor offered his time, money and celebrity name to over 50 charities and causes, according to Look to the Stars, a website that compiles the charitable works of celebrities. One of his most visible efforts was fund-raising for the St. Jude Children's Research Hospital. Williams began appearing in commercials and public service announcements for the hospital in 2004. St. Jude said Williams never charged a fee for his participation in any events or activities. "Whenever he had an opportunity to meet patients and families he would do it. When you have a person of Robin's caliber, it helps sick kids forget about their diseases for a while." said Kelly Schulz, vice president of communications at St. Jude. The same year, Williams joined the board of the Christopher & Dana Reeve Foundation, which raises money for spinal cord injury research. Williams served on the board for four years. Williams and Christopher Reeve, the actor and director, were roommates when they were students at the Juilliard performing arts school in New York. 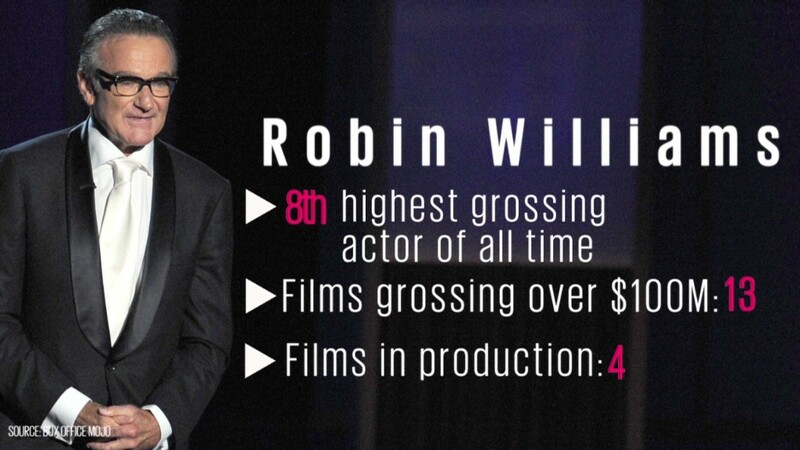 "Robin would do two or three dinners or events for us each year," said Peter Wilderotter, CEO of the foundation. "Many celebs have requirements about cars and who they will talk to, but Robin was the opposite. He showed up on his own and he stayed at our events and talked to everyone," said Wilderotter. While he would not discuss amounts, Wilderotter said that Williams was also very generous in his financial support of the foundation. "These weren't token gifts," he said. Wilderotter added that Williams lent his name to the organization because of his special relationship with Reeve. Fund-raising letters using Williams' name, "always had a better response than the usual fund-raising letters," he said. Williams was also a big supporter of the United Service Organizations, or USO, which provides support and morale-boosting performances to U.S. troops and their families. The USO said that throughout his 12 years of involvement with the organization, Williams created special moments for nearly 90,000 servicemen and servicewomen in 13 countries. "Williams traveled around the world to lift the spirits of our troops and their families. He will always be a part of our USO family and will be sorely missed," the organization said in a statement.